Its model number and name is #102 / Blanka. 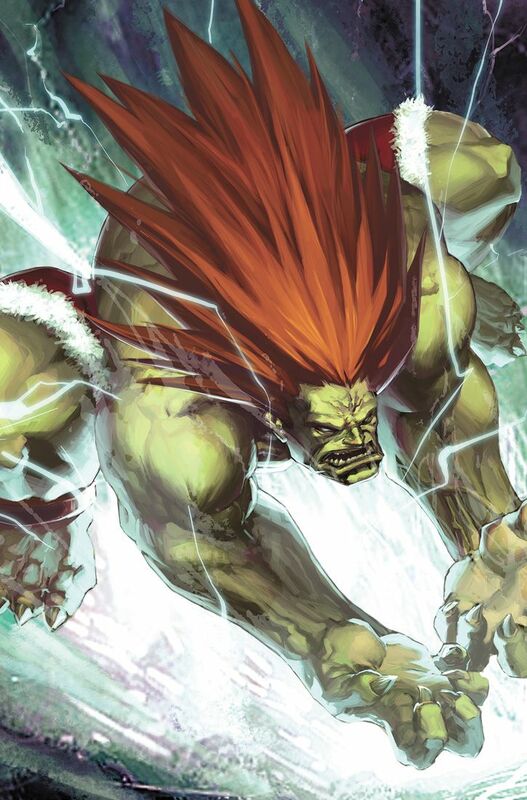 Character Bio - Blanka, the wildman of Brazil, is a beast shrouded in mystery. Once, long ago, he was a boy named Jimmy from a local village, but a plane crash left him stranded alone in the rainforests. Years later he re-emerged, with green skin, orange hair, and new, mysterious electric abilities. Shunned and feared, he has taken to fighting in global tournaments - the one world where he can command respect. As a Human, Blanka has these Human Synergies. As a Creature, Blanka has these Creature Synergies. As a Human, Blanka interacts differently with certain special powers. Current Special Powers that Interact Differently with Humans. As a Creature, an opponent's Hellboy rolls 2 additional attack dice when attacking Blanka due to Hellboy's Right Hand of Doom special power. As a figure with a Special Attack, Blanka interacts differently with certain special powers. Current Special Powers that Interact Differently with Special Attacks. Figures with the Electrically Charged special power are not affect by Blanka's Electric Skin special power. Current figures with the Electrically Charged special power. Instead of moving and attacking normally, Blanka may move up to 3 spaces in a straight line. During this move, Blanka may move over water without stopping but cannot move up any levels of terrain. After moving, roll 3 attack dice once for all figures adjacent to Blanka. Each figure rolls defense dice separately. If a defending figure was not adjacent to Blanka at the start of his turn, each skull rolled counts as an additional hit against that figure. If any figure without the Electrically Charged special power moves adjacent to Blanka, you must roll the 20-sided die. If you roll 13 or higher, that figure receives one wound, and you may roll again for Electric Skin. Figures may be initially targeted only as they move adjacent to Blanka. If Blanka ends his normal movement adjacent to an Evergreen Tree or Jungle Piece, he may Jungle Leap. Jungle Leap has a move of 3. When counting spaces for Jungle Leap, ignore elevations. Blanka may leap over water without stopping, leap over figures without becoming engaged, and leap over obstacles such as ruins. Blanka may not leap more than 10 levels up or down in a single leap. When Blanka starts to Jungle Leap, he will not take any leaving engagement attacks. Last edited by TrollBrute; July 23rd, 2016 at 03:23 PM. Hopefully @SirGalahad has a chance to pop in at some point and give his two cents! Pretty much taken verbatim from SirG's original draft. He can electrify himself - check. He curls himself into a ball and launches at people - check. 1) Do we want him as a Fighter or a Creature? Both have pros and cons, both are accurate. 2) Human or Mutate? Again, either works. 3) Are we set with those powers as-is, or do we want a third in there? If so, something like Tracking or Jungle Camouflage would be my preference - something to represent his whole "wildman of the Amazon" background. Seems like the wording for Lightning Cannonball could be simplified, but otherwise I think it's really cool. Is there any reason why we couldn't just reuse Electro's Electric Skin here instead of creating Electric Thunder? If any figure without the Electrically Charged special power moves adjacent to Electro, you must roll the 20-sided die. If you roll 12 or higher, that figure receives one wound, and you may roll again for Electric Skin. Figures may be initially targeted only as they move adjacent to Electro. I don't know the character so I can't really help with either of these. All the options seem fine mechanically though. Should he have Electrically Charged himself? If not, what about borrowing Jungle Strength from Zabu? Electric Thunder is from SirG's original draft, and I assume it's to use the name of his attack in-game. That being said, I agree it's pretty much just Electric Skin, which is more or less accurate to Blanka in game. We can either just go with the original or jazz up Electric Thunder to make it different. He shouldn't have Electrically Charged - he's not made of electricity or always exuding electricity or anything, he just uses it as a weapon, in the same way Ken and Dhalsim use fire. 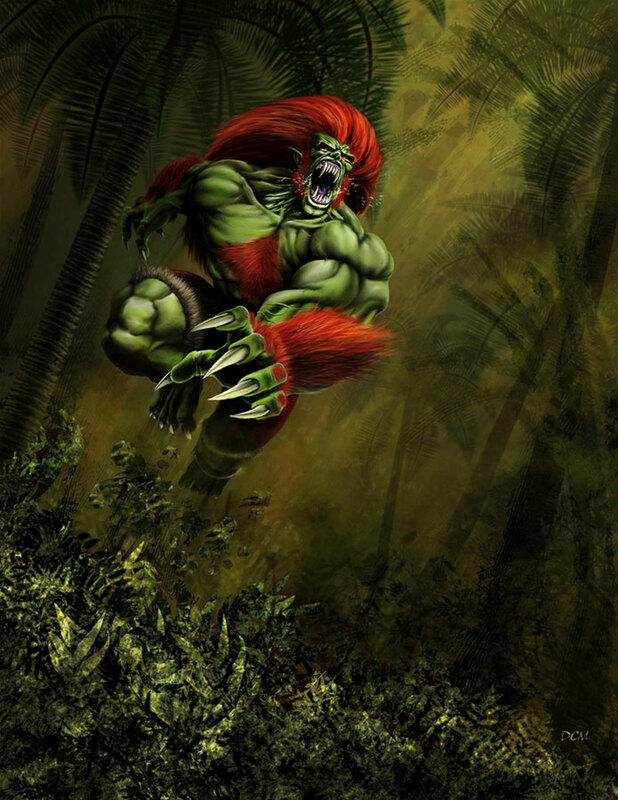 We could do Jungle Strength but that seems a bit basic to me and would encourage camping, which is pretty un-Blanka - he should be rocketing out of the jungle, not luring people into it. If Blanka ends his normal movement adjacent to an Evergreen Tree or Jungle Piece, he may Jungle Leap. Jungle Leap has a move of 3. 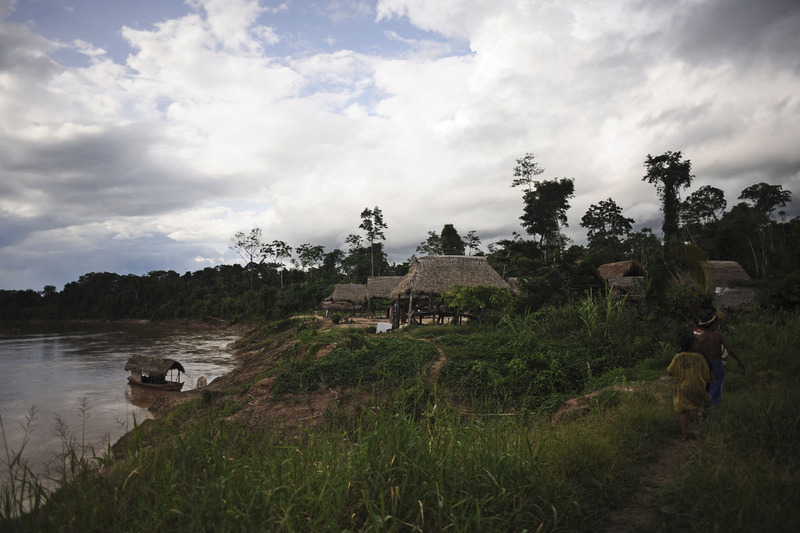 When counting spaces for Jungle Leap, ignore elevations. Blanka may leap over figures without becoming engaged, and leap over obstacles such as ruins. Blanka may not leap more than 10 levels up or down in a single leap. When Blanka starts to Jungle Leap, he will not take any leaving engagement attacks. My preference would be for reusing here, but it'd be fine with Electric Thunder if we change it up some. Hmm, good point. In that case, I like japes' suggestion. Other alternatives would be reusing Vine Swing from Ka-Zar or Jungle Tracking from the Classic 'Scape Quasatch Hunters. 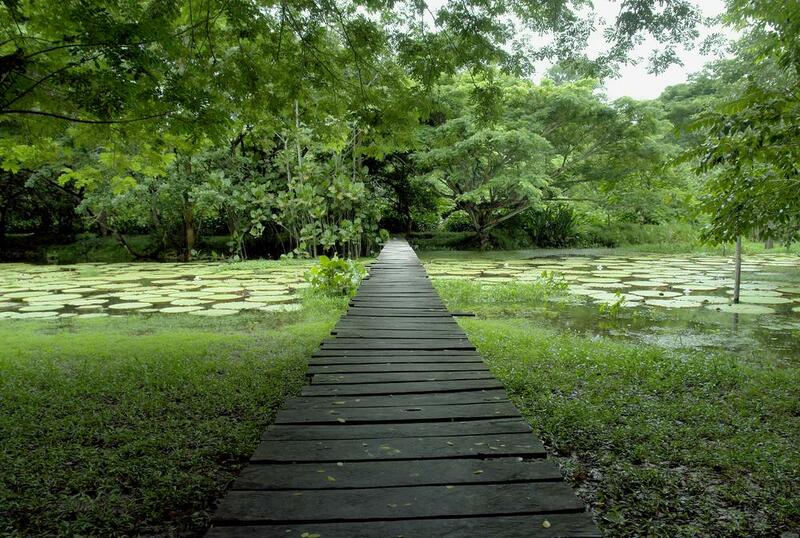 I think I'd probably go with Jungle Leap (great idea, just what I was picturing!) but Jungle Tracking would probably fulfill the same needs and be shorter. Guess it really just depends on card real estate. Don't know the character, but looks like fun. I do agree with V, Electric Thunder could little something else or swapped for Electric Skin. Electric Skin or beef up Thunder. What about making it an auto-wound as long as Blanka is not engaged? Could be scary with throwers but we could consider wording it for movement only. Tracking or Jungle Leap look nice. Tough call on Class and Species. Is there any more info on him? I think he fits a little better with Creature especially with Leap. They could use a cool static power in their faction. Luke Cage would love him too, especially with that low cost. Blanka's origin is pretty vague. I err towards Human Creature.